We wanted to say a big thank you to you for all that you did at our wedding. Everyone had a great time! Fantastic songs! You were very easy to work with and helped make our day magical. We just wanted to say thank you for doing such a great job for us on the 2nd of November. Everyone had a lot of fun and it was exactly what we wanted or the night. Thank you so much for last night you were brilliant. Can’t thank you enough for helping out with everything it was perfect. And we nailed Zoe’s surprise. Couldn’t of done it without you! We were so happy with our evening music supplied by Wayne. We were able to pick the music we wanted so it really suited us as a couple. Everyone loved it! 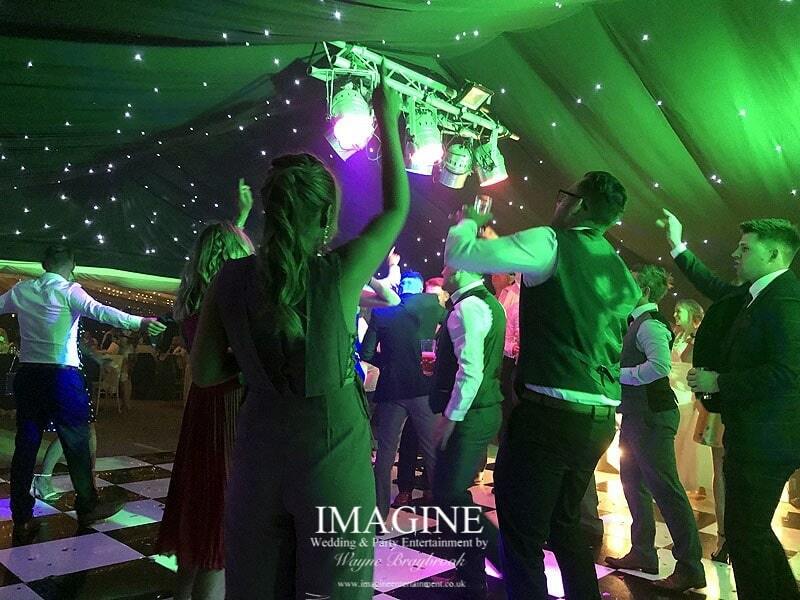 Hi, I’m Wayne, a FULL-TIME, award-winning WEDDING DJ and mobile disco with over 30 years of experience in providing wedding & party entertainment in Cambridgeshire, Norfolk & Suffolk. With a pride and passion for everything I do, and a proven history of providing outstanding wedding disco and party DJ entertainment, I’d love to be a part of your celebration! I work differently from a lot of DJs. I strongly believe that you should have a big say in how your party or wedding disco entertainment is provided. What I certainly won’t do is arrive at your party expecting to press the play button on the same playlist that I use at every other celebration I work at….because it just doesn’t work! Customer Service as it should be! When you deal with Imagine, it’s ME you’ll be working with right from your very first enquiry until the last dance of the night. I’m not an agency, I don’t employ other DJs to entertain at your party and I certainly don’t subcontract….it’s me that will be there on your big night, and that’s a fact I’m very proud of! I work hard to ensure I’m providing EXACTLY the type of entertainment you want for your wedding or adult party and will happily go the extra mile to make sure I’m getting things right….my reputation relies on it! Hi, I’m Wayne, a FULL TIME award winning WEDDING DJ and mobile disco with over 30 years of experience in providing wedding & party entertainment in Cambridgeshire, Norfolk & Suffolk. Let me answer some questions for you before you even ask them! Will you be there on the day of my party? Yes, I will! Barring me being critically ill or dead, I’ll be there for you to entertain your guests. Although the critically ill or dead bit was tongue in cheek, I do have back up plans and colleagues I can rely on should the unthinkable happen though! I make a promise to provide your party entertainment and I do everything in my power to ensure it happens! There are some more unscrupulous operators out there (as with all trades) who will leave you high and dry because they’ve been offered as little as £20 more to work elsewhere…I absolutely WILL NOT do that! Once you book me, I’m yours, no matter how many other offers appear for the same date….it’s as simple as that! Will you play the music I want to hear? Of course I will! I’m aware that there are DJs out there who have “set lists” and only play what they want to hear. Your celebration isn’t about my personal likes and dislikes…..it’s all about YOU! If you have particular music you want to hear on the night I’m more than happy to play it! After all, it’s your party, not mine! Will you play “cheesy” music? That is entirely up to you! If you don’t want to hear the YMCA, 9 to 5, Abba or S-Club 7 then I won’t play it. If you DO want that sort of music though, I’m more than happy to oblige. It’s YOUR party and I’ll play whatever YOU want to hear! I’m happy to provide parties with absolutely “no cheese”, or parties that come from the bottom shelf of the local deli counter…you tell me what you want and I’ll happily comply! Do you take guest requests? Of course I do (if you want me to!). From 30+ years of providing wedding and party entertainment, I can honestly say that the very best parties are those where the guests have selected the music….because they’ll dance to it. And a full dance floor is what you want…isn’t it? Will my guests have a good time? I’ll do my best to make sure this happens! I’ve been doing this job for 30+ years and in that time, I’ve NEVER received a complaint from a dissatisfied customer, and that’s a record I’m proud of! I genuinely care about the service I provide and will happily go the extra mile to ensure that I’m doing everything (and more) that you’d expect from me….my reputation absolutely relies on that and it’s not something I’m willing to sacrifice! I’ll quite happily tell you many stories of previous parties where I’ve done things that my client hasn’t expected but have made their night memorable. I actually analyse what I could have done differently/better after every single party during my drive home at silly ‘o’ clock in the morning – I really DO care about each and every party I entertain at! Do you have a cheesy microphone voice? Definitely not! Speak to me on the telephone and that’s the voice you’ll hear during your party. I’m not a wrestling announcer, I’m not Alan Dedicoat from Strictly Come Dancing, I’m me! I have a voice which is a cross between Fenland and Cambridge (because that’s where I’m from) and I’m proud of it! Yes, it is, and that alone separates me from the hobbyists and the bedroom DJs that think they can provide a top class service. They may charge a lot less than me, but can they provide the same level of service and professionalism for your special party? Does that sound like the type of DJ you’d like for YOUR party? Planning a rustic style wedding? Are you planning a rustic themed wedding? Why not consider hiring a DJ with a rustic DJ Booth to complement your venue styling? You’ll love what I do!